Amit Shah did the impossible yesterday: he got the entire spectrum of opposition together, indulging in a public display of affection and unity at the swearing-in of H D Kumaraswamy as the Chief Minister of Karnataka. Shah's approach of politics as a zero sum game with winning being everything has managed to ensure that his strategic objective of a fractious opposition has for the moment failed. Senior Congress leader Digvijaya Singh who has just been announced as the chief of the party's coordination committee for the upcoming Madhya Pradesh elections says, "The unity will last and you will see tactical alliances in all upcoming elections including Madhya Pradesh". 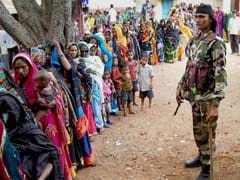 But he refuses to comment on the million dollar question of whether the Congress will secure a pre-poll alliance with Mayawati and her Bahujan Samaj Party (BSP). However, talks are on with the last round was held two days ago in Bengaluru where West Bengal Chief Minister Mamata Banerjee had a three-hour meeting over dinner playing go-between for Mayawati and the Congress (also present was Ashok Gehlot, the new go-to for Congress President Rahul Gandhi). Banerjee sweetened the deal-making with mithai she had flown in from Kolkata. 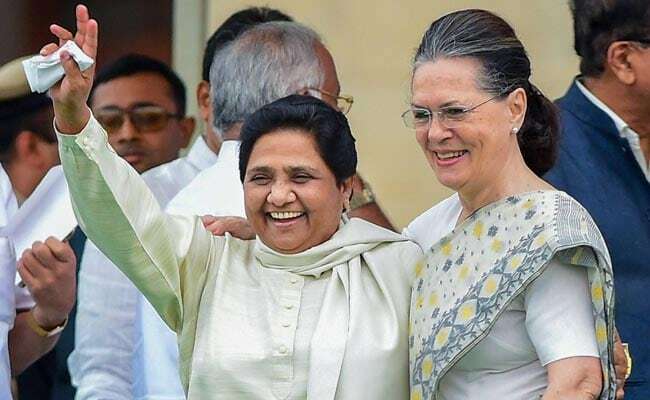 It was apparent that "Maha-gatbandhan" (mega-alliance) optics hit the sweet spot on stage yesterday as Mayawati smiled more than she ever has in public while hugged close by Sonia Gandhi. Meanwhile, Akhilesh Yadav, her new heavyweight partner in Uttar Pradesh, the real swing state of the country, touched Banerjee's feet on stage. 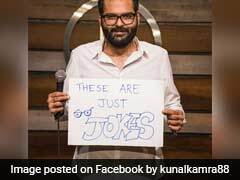 Even Chief Minister Arvind Kejriwal, the hitherto political pariah for the Congress Delhi, was part of the ensemble cast. So what does all this hectic activity imply? The biggest takeaway is that the Congress is now prepared to play junior partner in strategic alliances in order to keep Modi and the BJP. A senior Congress leader says "The media analysis is so superficial. We deliberately did not ally with the JD(S) in Karnataka before the polls as it would have ensured that the entire Hindu vote would have been in play for Modi. The JD(S) was talking to the BJP before the polls just the way we are chatting with even the Shiv Sena for Palghar (upcoming Maharashtra by-election). If you go public on strategic alliances, it helps Modi, as we realised in the Uttar Pradesh assembly elections. 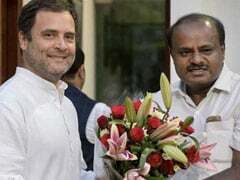 If we were riding our earlier high horse, would we have within five hours reached out to Kumaraswamy and offered him the Chief Minister's post?. Both the Gandhis have realised that to take on Modi and Shah, we need complete opposition unity." But how will the competing interests of players like Mamata and the Left work in states where they are fierce rivals? Several political leaders present at yesterday's event say that only a very loose federation may emerge with the consensus being that Sonia Gandhi and interestingly Sharad Pawar be tasked with the fire-fighting within the alliance. Says a senior leader, "Banerjee knows that the BJP is the real opposition, not the Left. She was spooked by Shah's actions in Bengal where he said he would uproot her." Pawar shares a warm relationship with Navin Patnaik, the Chief Minister of Odisha, who declined to be part of the swearing-in, and will now reach out to him. Pawar had earlier used his smooth interpersonal skills to attempt a tacit understanding with Modi; he now seems committed to the opposition project. Pawar and senior Congress leader Ahmed Patel have jointly been reaching out to Shiv Sena chief Uddhav Thackeray over the Palghar seat. Thackeray, who on a daily basis attacks Modi, is finally ready to break the 20-year-old alliance of the BJP and Sena. This will have interesting implications on Maharashtra politics. Maharashtra sends the second-largest contingent of Lok Sabha MPs (48) after UP's 80. So Gandhi Junior will not only have to play second fiddle to the other parties but to his mother as well who seems to have put her announced retirement on hold as she acts as the chief strategist of the new maha-gatbandhan. Sonia Gandhi was the one who called Deve Gowda to ensure he picked the Congress and not the BJP as his partner and she is expected to be the one dealing with Mayawati, who like the Congress has learnt to be far more flexible. Mayawati had allied with the JD(S) in Karnataka and won one seat. 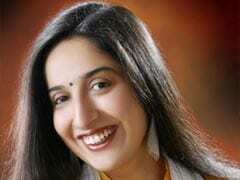 She also kept up pressure on Deve Gowda and Kumaraswamy to go with the Congress. Mayawati is likely to come and meet Sonia and Rahul in Delhi soon for the Madhya Pradesh blueprint. Next week, her fledgling understanding with the Samajwadi Party in Uttar Pradesh will be tested in the Kairana by-election where the opposition is putting up a united candidate against the BJP. Shah has pulled out all the stops for the by-election as even the 104 seats that the BJP collected in Karnataka did not translate into a win. His reputation and his impressive record are on the line. Make no mistake - like Gorakhpur, Kairana is going to be a big one.